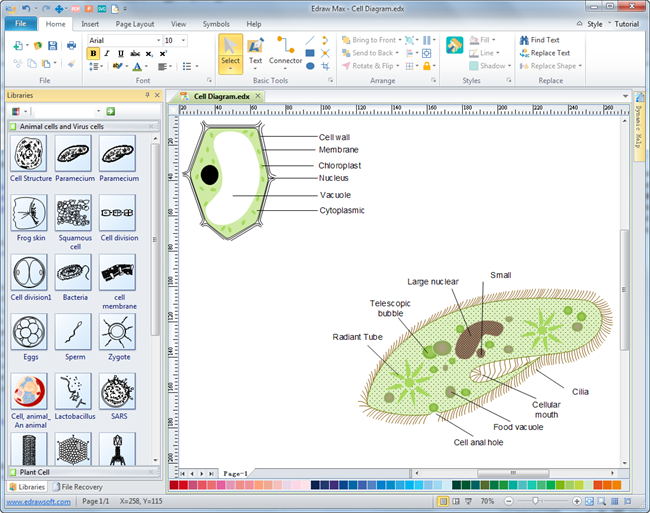 Excellent cells diagram drawing software with rich built-in cell symbols and templates. Help users develop high-quality cells diagrams in minutes. Excellent cells diagram software lets users create custom human cells diagram, animal cells diagram and virus cells diagram from built-in vector cells images. 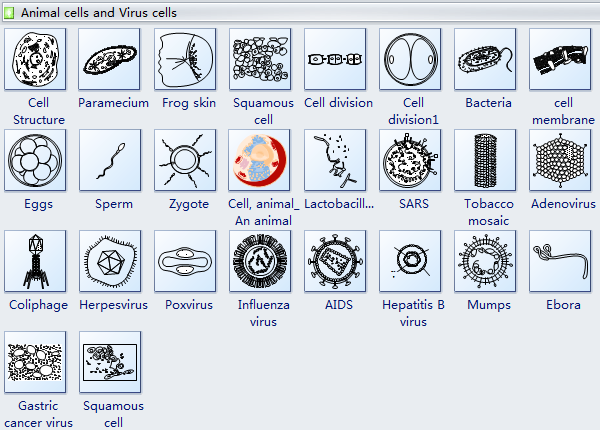 When opening the software, you will get an instant access to a large collection of pre-made cells symbols. Only through dragging and dropping, together with some minor changes on the size, color and text, you will create a quality cell diagram tailored to your need. It's perfect for teachers to make pre-class exercises, teaching slides, or quiz for students. As the picture shows below, Edraw cells diagram software has a simple and straightforward users interface, which has a close similarity with Microsoft program. It's like an old friend that you don't have to spend tons of time getting familiar with. Besides cells diagram, it also has solutions for other subjects such as human organs diagram, laboratory equipment diagram, mechanics diagram, chemistry equation diagram, molecular model diagram, and a lot more. Download a free trial and see first-hand how quickly and easily you can create great-looking cells diagram. From the built-in Cells Library, you can find symbols of cell structure, paramecium, squamous cell, cell division, bacteria, cell membrane, eggs, sperm, zygote, an animal cell, SARS, tobacco mosaic, adenovirus, coliphage, herpesvirus, AIDS, pollen, plant cell model, onion tissue, etc. They are vector symbols available to change size and edit. To learn more about each cell symbol, please click Cell Diagram Symbols for further information. As teaching materials, you always need to label terms and add descriptions to the cells diagrams. With Edraw pre-made callouts symbol library, it's just one click away. We have eliminated additional supplementaries and made the cells black-and-white, so that users can edit. You can fill them with colors to make the cell diagrams vivid, so that students won't be bore while they are learning. Choose Science category under Available Templates. Double click the icon of Cells in the Templates window. From the opened Cells Library on the left of the canvas, drag and drop the necessary symbols. Select the shape, and drag control handles to resize it. From the Callouts Library, drag and drop suitable callout on your diagram, and double click the sample text to add your own text.